Only the seeds on this page are limited-access—not to restrict availability, but to encourage successful propagation. (About Reserved Access) All other seeds are unrestricted access. To receive these seeds, simply write on your request "I agree to the reserved-access terms." NOTE: We do not supply these seeds unless you include the sentence: "I agree to the reserved-access terms." on your request! 1. Agree to propagate and distribute the plants, and to share their germination results. 2. Agree to distribute solely in the public domain—no patents, trademarks, or other intellectual property. 3. Commercial propagation is encouraged, but in the unlikely event that large-scale commercial distribution is achieved, benefit-sharing along the path towards the source, in accordance with the spirit of the International Convention on Biological Diversity, will be undertaken. 4. Absolutely, positively, NO refunds or replacements for any reason other than out-of-stock! Thanks for helping insure that we can continue to distribute these special seeds! Extremely rare tree or shrub to 40 feet, with broad, oval, pointed 2 - 4" leaves, and small flower-balls followed by 6" pods. Endemic to New Caledonia and Vanuatu, often growing in seashore dunes. Does well in Florida—try it in S. California and Texas. "This tree thrives on abuse. It seems to grow with no water, highly alkaline soil, and strong sunlight. It is remarkable. My trees were submerged in salt water during a storm and did not even blink. "—H.P., Florida Keys. Nick seed to germinate in 2 - 4 weeks. Scarce as hen's teeth! 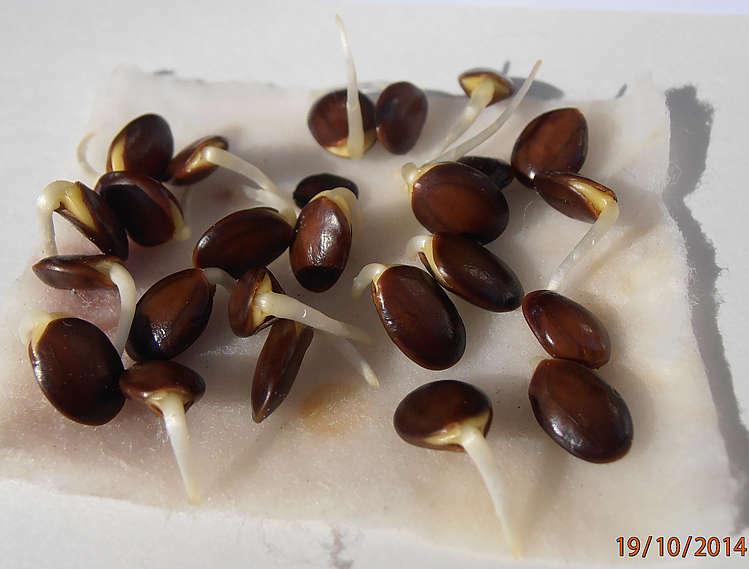 To maximize germination of these expensive seed: Nick seed lightly with a file - just abrade the surface and don't go all the way to the quick - then soak for 15 minutes in a solution made of 1 part household bleach and 8 parts water. Rinse them well. Fold a paper towel into quarters and moisten with distilled water. Squeeze out excess, so it is just damp, and put on a clean plate. Put the seeds (nicked side down) on the towel and cover with plastic wrap, leaving an air space above the seeds. Keep in a warm place (70 - 80°F) and inspect every day. Any seeds that don't swell in a day or two should be re-nicked and re-sterilized. Any seeds that develop mold should be removed and re-sterilized and put on a separate plate - most of these will sprout, too, but this keeps the others clean. When the roots are a half-inch long, plant the seed in a light, well-drained seed-starting mix, and keep warm. If you have had trouble with these in the past, try this method and you are sure to be successful! This method gives high germination. CACTACEAE. Small endangered cacti. No export. RANUNCULACEAE. 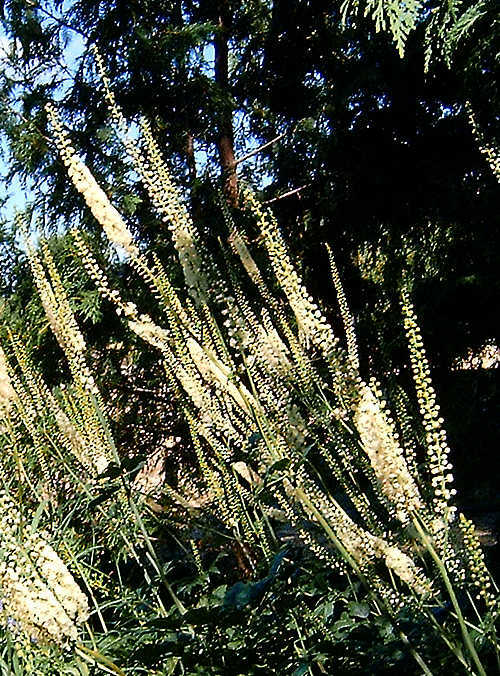 Tall, stately, North Hemisphere woodland perennials grown for their slender spikes of flowers and handsome foliage, and also for their valuable medicinal roots. Good in part shade. 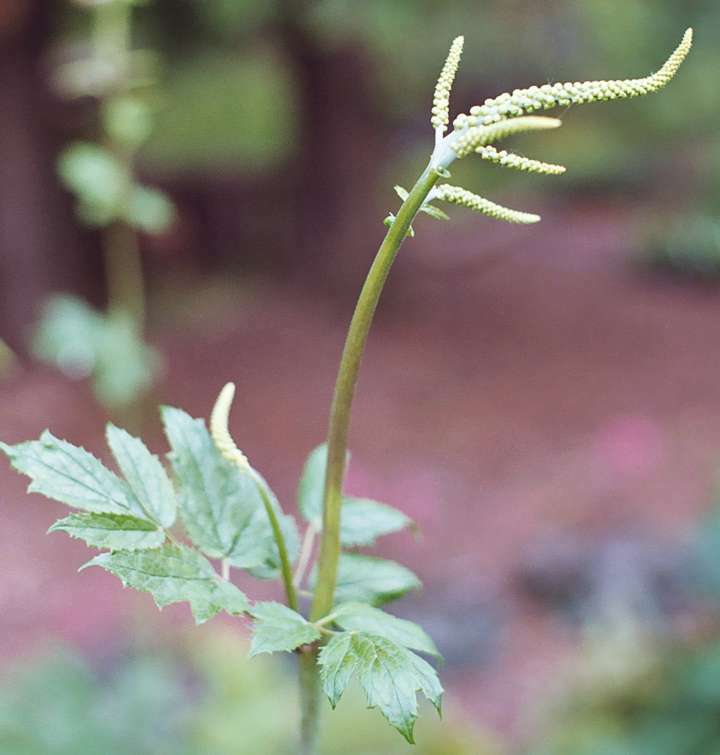 'BLACK COHOSH', 'BLACK SNAKEROOT'. Narrow spikes of small white flowers, up to 2 feet long, in July and August. Bold perennial to 8 feet, with shiny, dark green compound leaves. E. N. America. Zone 4. Very showy and good in rich moist soil and part shade. The valuable medicinal roots are one of the best remedies for problems associated with menopause, PMS, ringing in the ears, and depression. Seed needs 2 - 10 weeks warm, then 12 weeks cold to germinate. Hold pots 3 years. 'ROCKY MOUNTAIN BEE PLANT', 'TU'MI' (Hopi name). Rosy lavender 1/2" flowers in dense racemes from June to August. Annual to 2 - 3 feet with trifoliate leaves. N. America. Zone 3. Grown as a bee-crop for a century. Excellent cut flower or annual hedge. The boiled leaves and flowers are eaten, tasting like mustard. The Hopi allow it to seed in their corn fields for spring greens, and they use it in making prayer-sticks. The Tewa of the Rio Grande make pottery paint with it. The Ramah Navaho boil the young plants 1 - 2 hours and discard the water. They use a cold infusion of the leaves as a deodorant. The Nightway god-impersonators drink a tea made of 'a few seeds' to gain a strong voice. Attracts butterflies. Sow in fall or give cold treatment and plant out when the ground is still cold. Strong sunlight may help. "If seed isn't scattered in fall or patted onto thawing soil in earliest spring, the soil is too warm and the seed does not germinate."—D.S. Larkin, Utah, 1/2001. LILIACEAE. Crocus-like cormous perennials from the Mediterranean and Central Asia, most blooming in late summer and fall, after the narrow leaves wither. Good in full sun. "Colchicums are most charming and interesting plants of easy culture."—L.H. Bailey. Seed often slow to germinate. 'AUTUMN CROCUS', 'MEADOW SAFFRON'. Showy purple or white flowers to 4" across, blooming in autumn. Hardy perennial with narrow, foot-long leaves. Europe. Zone 5. The corms and seeds are the source of colchicine, used in the treatment of gout and to induce chromosome doubling in plant breeding. Give seed warm/cold/warm, and seedlings will straggle in over 1 - 3 years. MAGNOLIACEAE. Ornamental woody vines with red or white flowers, handsome bright green foliage, and drooping clusters of scarlet berries. They twine to about 10 - 20 feet, and thrive in partly shaded moist areas. Male and female plants; grow several for the fruits. They are medicinal and some have edible fruits. 'CHINESE MAGNOLIA VINE', 'WU WEI ZI'. Fragrant white to pink 3/4" flowers followed by attractive 6" spikes of red berries on female vines. Woody twiner to 25 feet, with glossy, deep green 4" leaves. China. Zone 4. The fruits are an important tonic and adaptogen in Chinese medicine. Lightly nick, give 4 weeks warm, then 4 weeks cold, then 8 weeks cool (50°F), then sow. Others have found that soaking in water 4 days, then 4 weeks warm, then 4 weeks cold works. 'SILVER MILKTHISTLE', 'IVORY THISTLE'. 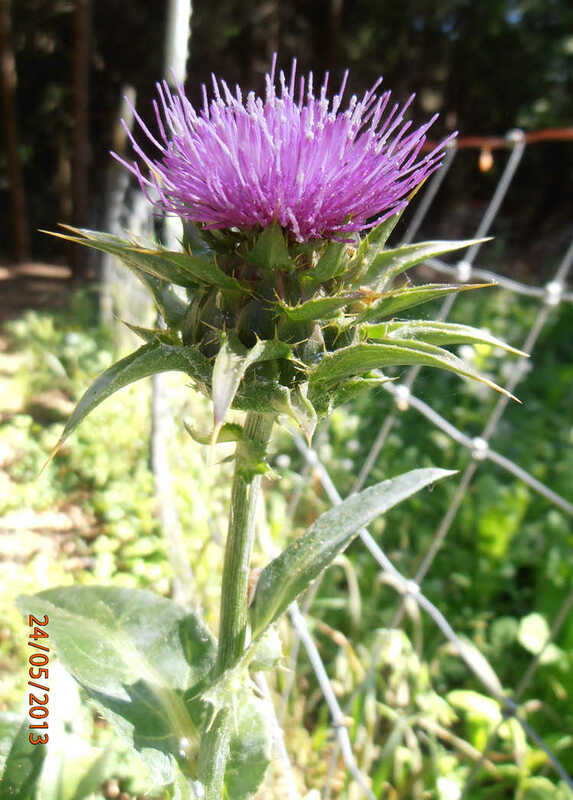 Tall annual thistle to 4 - 6 feet, with purple flowers. Similar to common milkthistle, but the leaves lack the marbling. Spain and N. Africa. Zone 7. 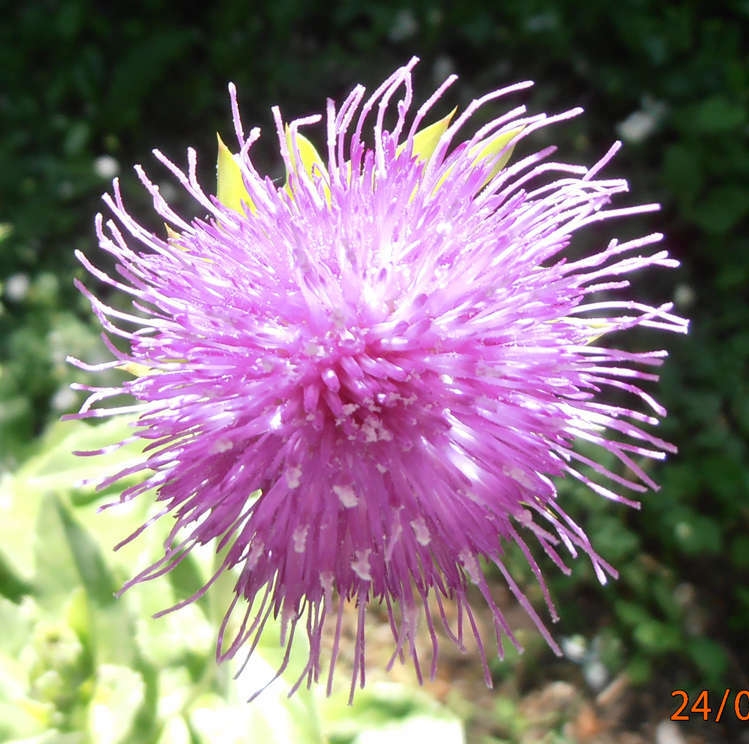 All parts edible like common milkthistle, and the seeds said to be rich in silymarin. Attracts bees. Germinates in 1 week.